In what has been a season of record rainfall in Seattle (I’m starting to believe that line in Sleepless in Seattle when a character says “It rains 9 months out of the year in Seattle”), when a nice day occurs on a weekend, everyone gets outside. We get outside even in bad weather, so when this nice day occurred, we were quick to hit the trails. 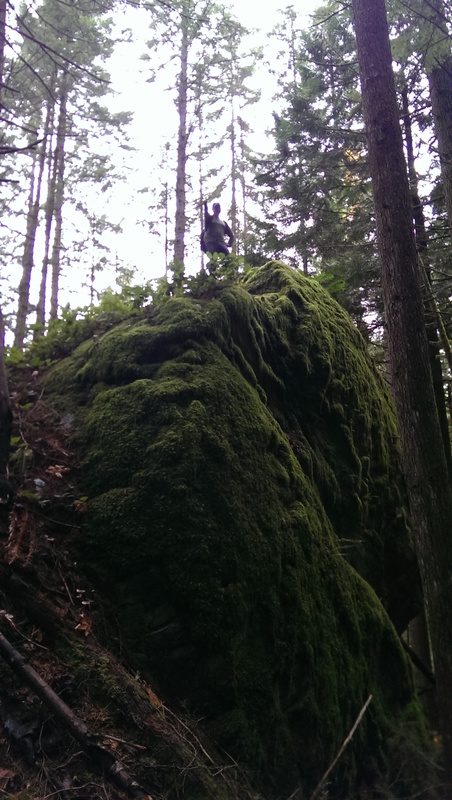 We decided to head to Chuckanut Drive just south of Bellingham and hike the beautiful Oyster Dome Trail. 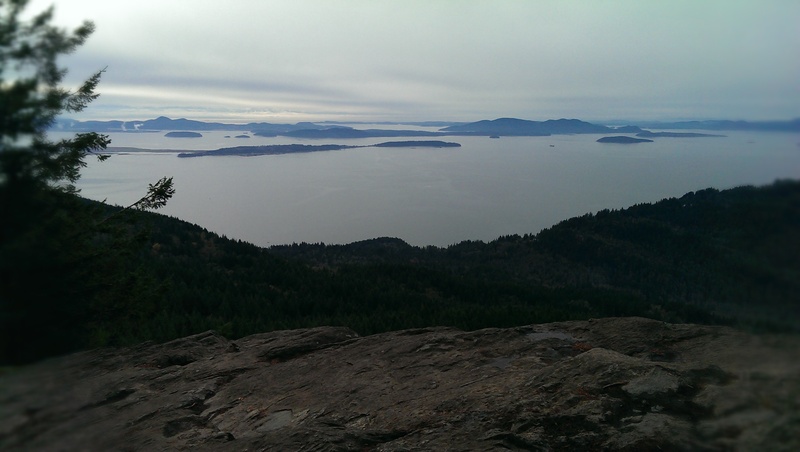 Oyster Dome sits atop Blanchard Mountain in the Chuckanut mountain range. 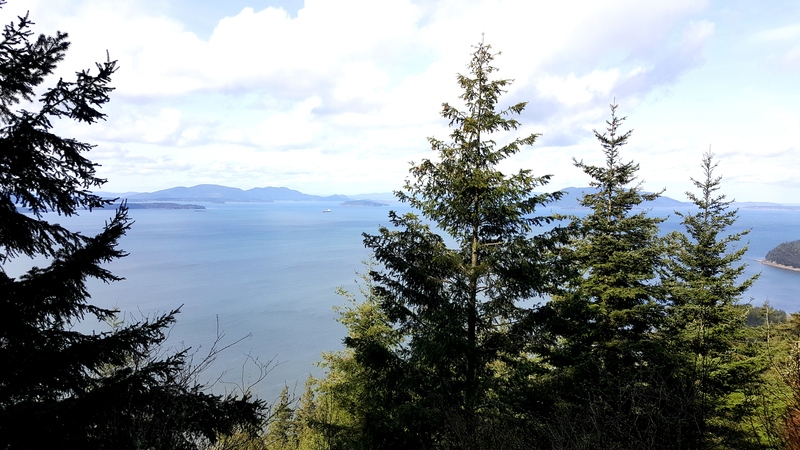 The Chuckanut mountains are the only place where the Cascade mountains reach the sea and while this is not an easy hike (rapid 1,900 foot elevation gain in just over 3 miles), the views from the dome at the top are well worth the effort. There are a couple of ways to approach Oyster Dome. 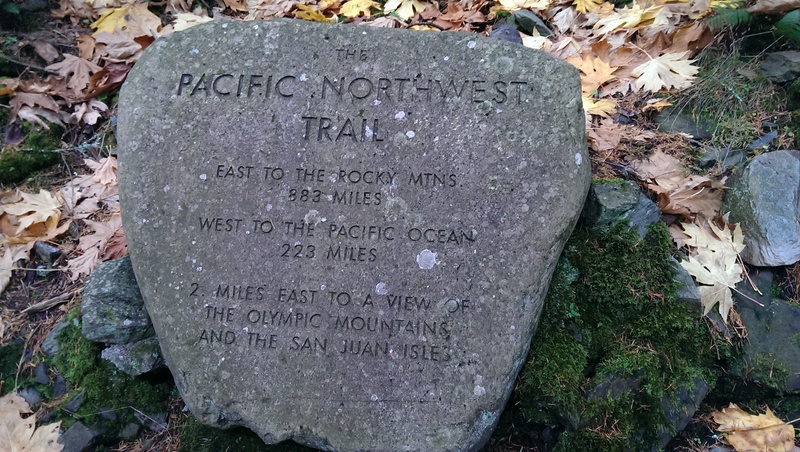 The way we’ve done in the past and which we chose to do on this day is to park along Chuckanut Drive (Highway 11 near milepost 10 and the Oyster Bar restaurant) and take the Pacific Northwest Trail up, up, up the mountain. The trailhead can be easily missed if it weren’t for all the cars parked along the side of the road. (Note to reader: use extreme caution walking along the road/crossing the road – this is a popular, scenic motorway and cars sometimes go fast). Immediately from the trailhead, there are a series of switchbacks. When we did the hike previously, it was autumn and there were the most gigantic leaves papering the trail. 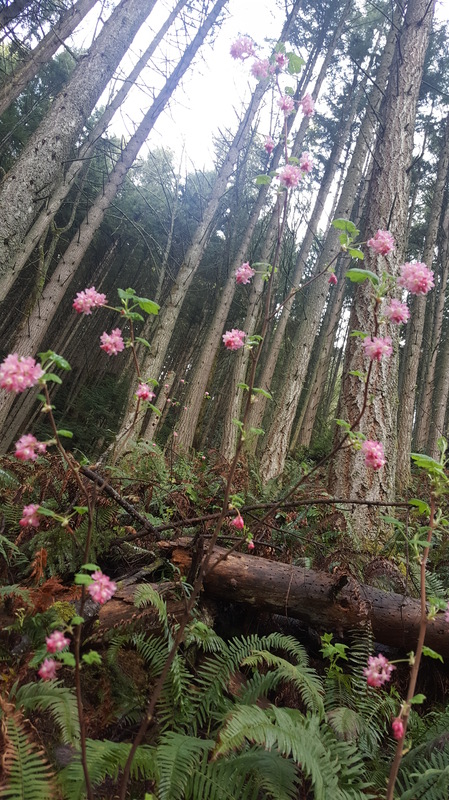 This time around, we were happy to see spring blossoms. 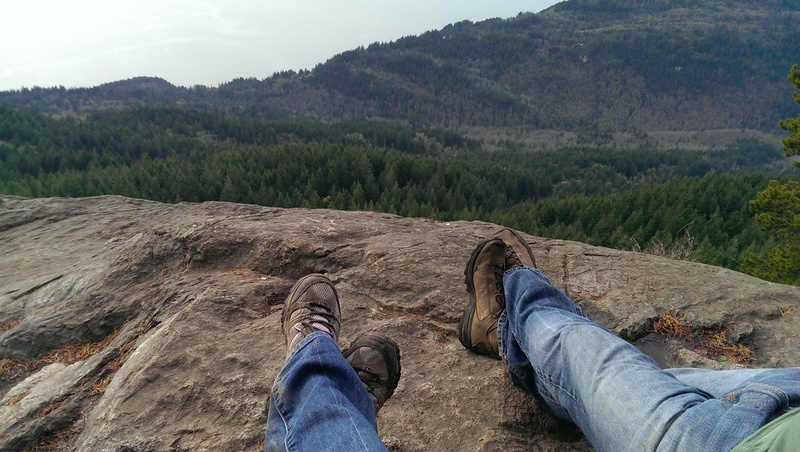 After about a mile, there is a scenic overlook with a bench for the weary to rest. It’s a lovely viewpoint. In another half mile, at the fork in the trail, stay to the right. 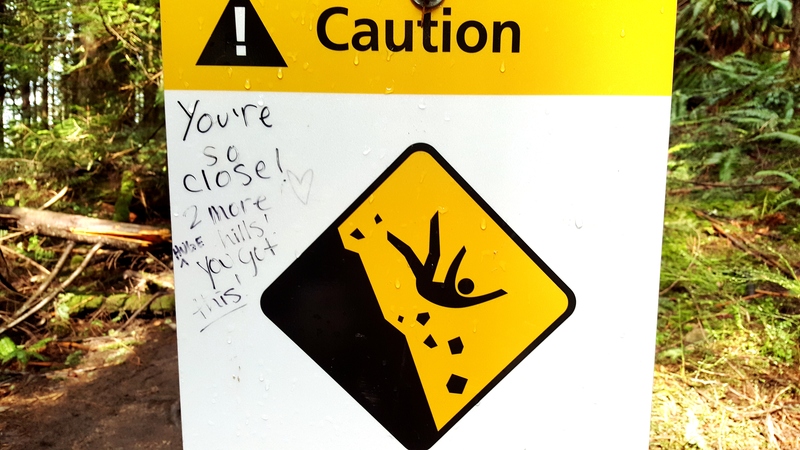 The signage is good – just keep following signs for Oyster Dome. 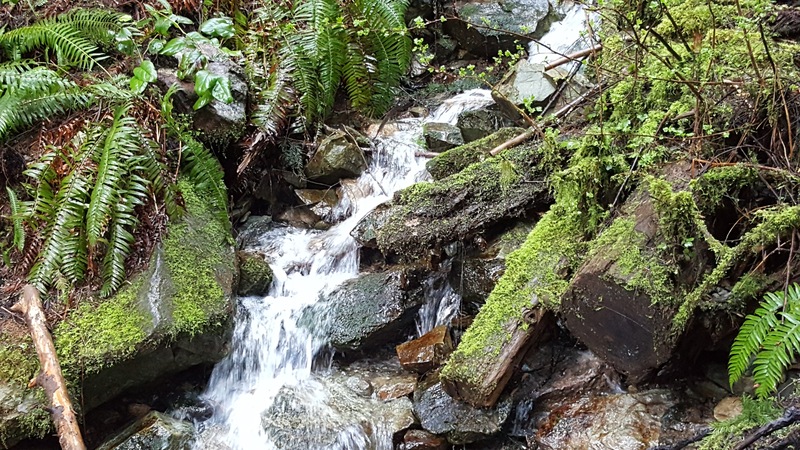 There are several small creeks with slight waterfalls along the way. Eventually you will enter the part of the hike known as “The Ice Age”. 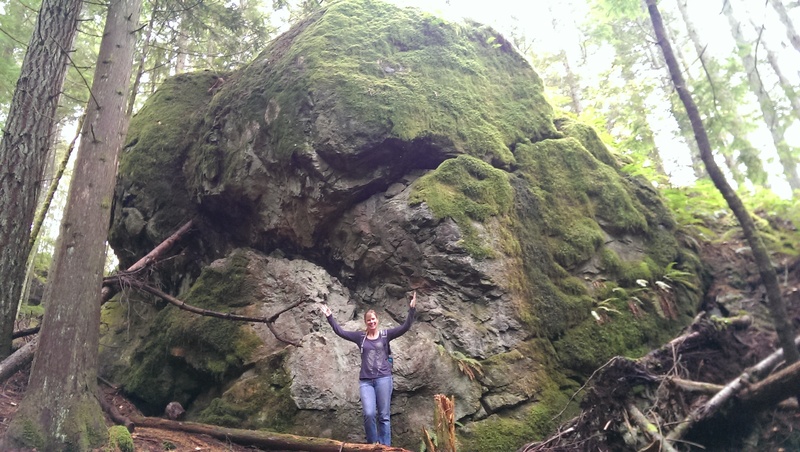 Here there are giant boulders which were formed by a glacier 18,000 years ago. 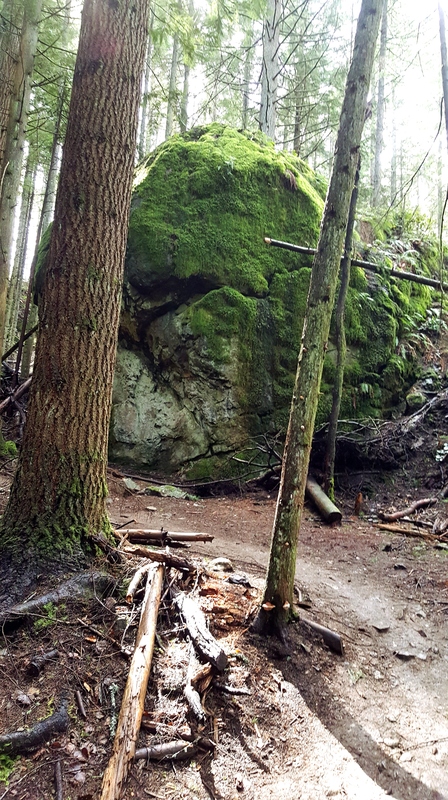 These boulders are moss-covered and magnificent. One appears to be “weeping” with water gently cascading down it. Once up this last hill, you reach the top – a plateau overlooking the Puget Sound and the San Juan Islands. It is a wonderful spot to rest, have a snack and take in the amazing beauty that stretches out as far as the eye can see (which on clear days is pretty far!). 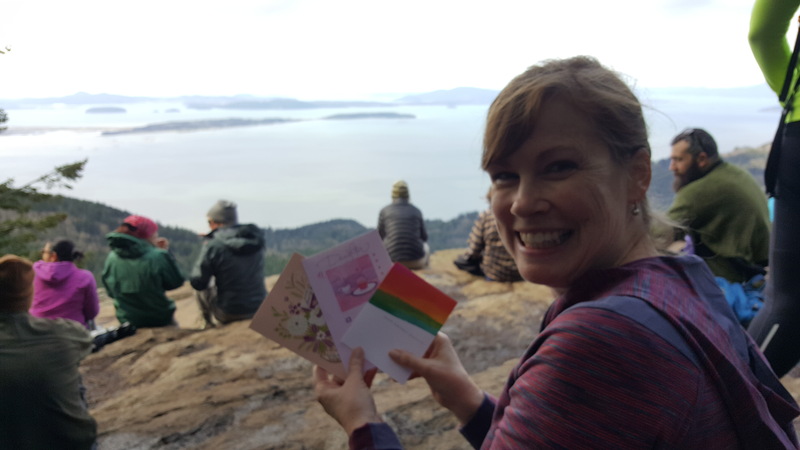 On this spring day, it happened to be my birthday, so I enjoyed reading cards from family and friends at the top of this steep hike. Some days you can be lucky (as we were on our first hike here) and have the plateau all to yourself. But on sunny days, just know there will be crowds. 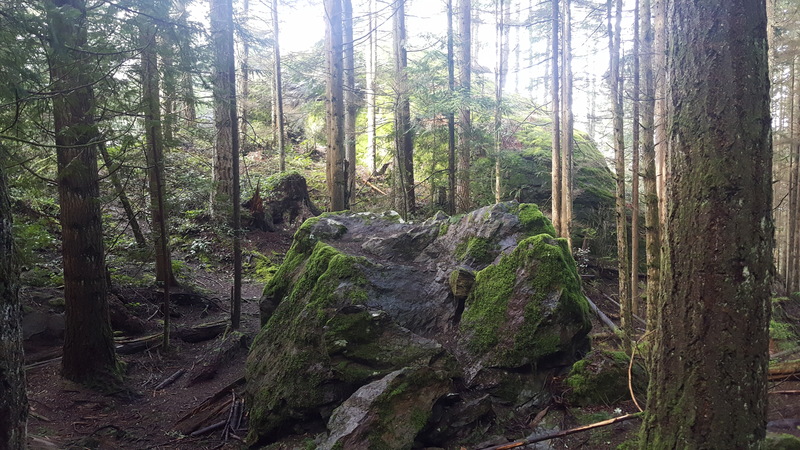 If you just stick to the Oyster Dome trail (and don’t take side trips to the Samish Bay Overlook or to Lily or Lizard Lakes) is 6.5 miles roundtrip and achieves 1,900 feet of elevation gain. The way down feels long (even though it is the same trail), but we reward ourselves at the end with a delicious lunch. After our first fall hike up Oyster Dome, we took our muddied selves into the Oyster Bar. Despite our muddy attire, the waitstaff didn’t seem to mind and we enjoyed a spectacular meal overlooking the Sound. This trip, we drove to Edison, where you may recall we recently did a “tour de food” (click here to read about that day of culinary delights). 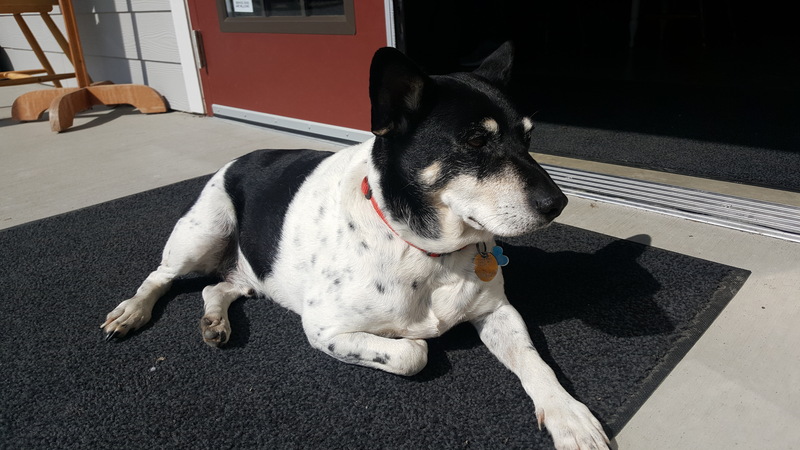 We had a recharging lunch at The Old Edison followed by a stop at Samish Bay Cheese, where Charlie the Cheese Dog assisted us with our purchases (really, he just stood watch outside). You can’t go wrong for food anywhere in this region, whether you continue north on Chuckanut Drive towards Bellingham or south to Edison, Mount Vernon, or La Conner. 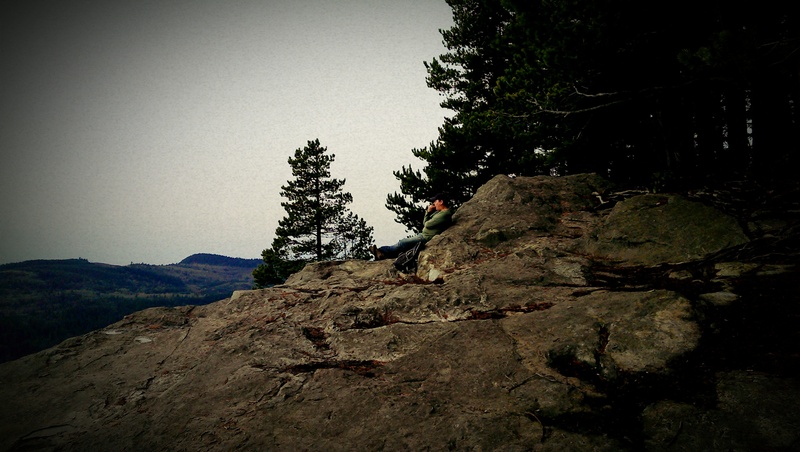 Reward yourself after the long steep hike! 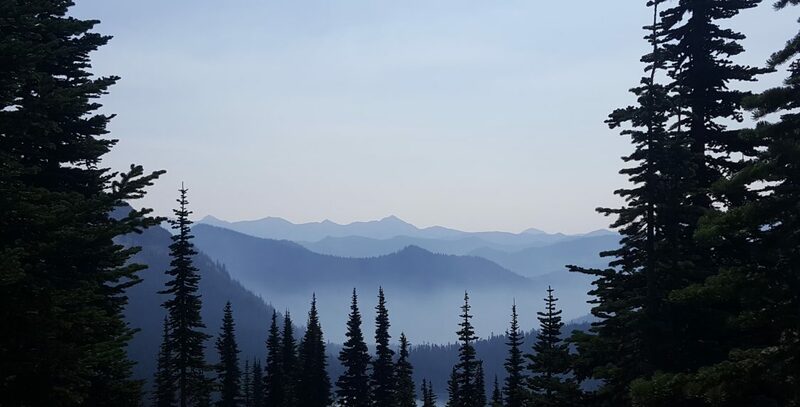 Directions to the Chirico Trailhead: From Seattle, drive north on Hwy I-5 and take exit 231 to WA-11 in Burlington. 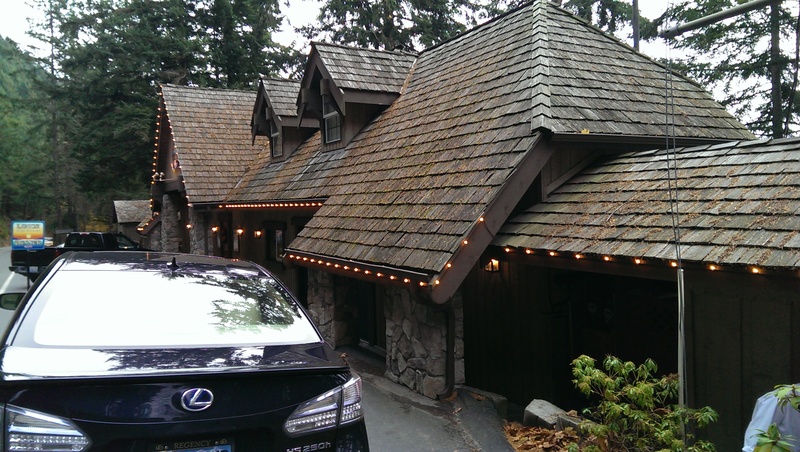 Drive north on WA-11 (Chuckanut Drive) about 10 miles. Just past mile marker 10 you will see the trailhead on the right side of the street. Park alongside the street, keeping clear of traffic. 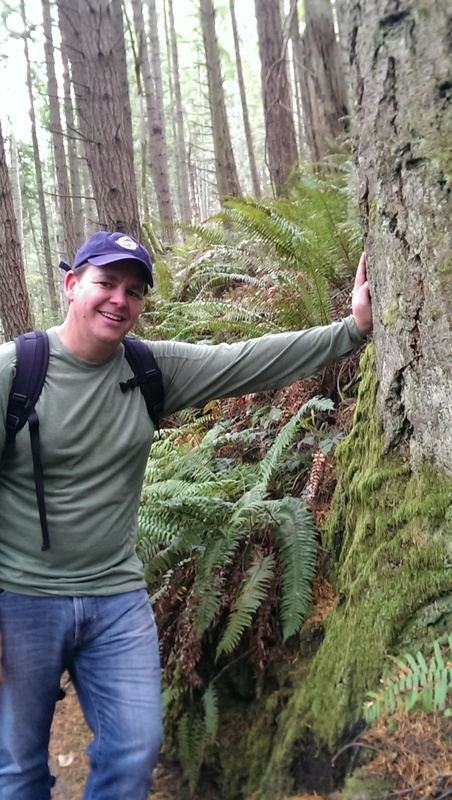 Trail stats: The hike is about 6.5 miles roundtrip with 1,900 feet of elevation gain.